An IP address is a unique number assigned to each device on the network. There are two kinds of IP addresses: IPv4 and IPv6. Their main difference is the number of addresses. Computers with IP addresses currently have an IPv4 address, and more and more computers are starting to use IPv6 addresses now. 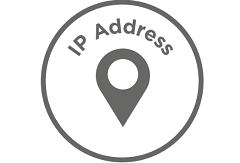 Just like the address you use to receive a package, all servers need to send data to your IP address. This means that your IP address must be visible to anyone, and you must disclose it to any website you visit. You can check your IP address by searching for “what is my IP address?” on the search engine. And who is interested in this series of numbers besides you? What if the IP address is closely related to the geographic location? Geolocation databases around the world match IP addresses to specific geographic locations. It can even be accurate to the street. If you are visiting a website that normally provides the right services, there is no problem, but the government, other motivated companies, and hackers can also query this information. And every website you visit will record your IP address, which pages you visited, the information you sent and received. It is easy for the governments, other motivated companies and hackers to match your IP address with your identity. At this time, you will have no privacy. So, for your privacy and security, hiding IP addresses is a necessity. The best way to hide IP address is using a VPN service. With a VPN software, you can choose lots of different IP address around the world. And there are more advantages to use a VPN: fast connection speed, protect your security and privacy, access to blocked sites, and VPN servers from all around the world. UFO VPN provides both free and paid service to suit all your needs, because we know to choose a good VPN is not easy. Do not hesitate to give it a try. TOR is a free anonymous browser that can help you hide your IP address when you use it to surf on the Internet. This means that the data you accept and send will be encrypted, which is good for security and privacy protection. A lot of people use TOR browser to search, shop online, and to communicate with others who are restricted Internet access in some countries. A company or school usually set up proxy servers to filter content. There are risks in using a proxy to mask your IP address: the Internet connection speed will become slow, unable to bypass the firewall and not all proxy servers use SSL connection. When you go to a cafe or hotel, if you connect to their Wi-Fi, you are using their network’s IP address instead of your own. However, public Wi-Fi is not secure. If you don’t use a VPN, your Internet activities may be monitored by others and the information may be stolen. Therefore, when using public Wi-Fi, do not shop online or enter any bank information.